Chancellors Don Straney and Noreen Yamane planted two ʻohia trees today at ʻImiloa Astronomy Center in honor of President M.R.C. Greenwood who is retiring at the end of the month. (L-R) UH Hilo Chancellor Don Straney; Leilani Lindsey-Kaʻapuni, ʻImiloa Executive Assistant; Margaret Shiba, ʻImiloa Director for Institutional Advancement; Sally Marrack, ʻImiloa Membership Coordinator; Kapua Kalani-Maskell, ʻImiloa Guest Services Associate; Hawaiʻi Community College Chancellor Noreen Yamane; Jeff Harman, ʻImiloa Sales and Marketing Manager; Gail Makuakāne-Lundin, Interim Executive Assistant to the Chancellor, UH Hilo; ʻAhia Dye, ʻImiloa Planetarium Technician and Operator. 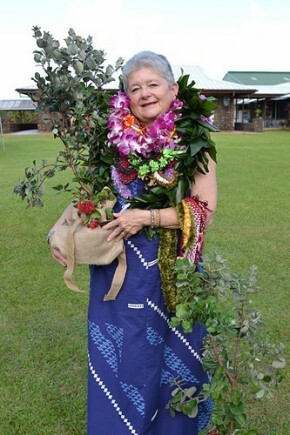 MRC Greenwood was presented the twoʻohia trees during her visit to UH Hilo on Aug 23. The trees were planted Aug 29 in her honor. Photo provided by UH System News. Outgoing University of Hawai‘i President M.R.C. 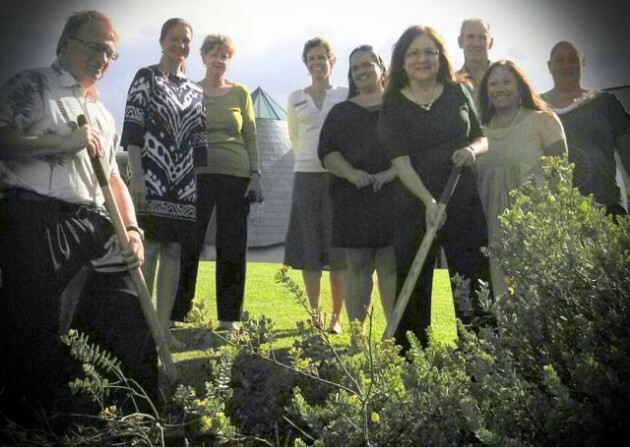 Greenwood was honored today with the planting of two ‘ōhi‘a lehua trees in the indigenous gardens at UH Hilo’s ‘Imiloa Astronomy Center. 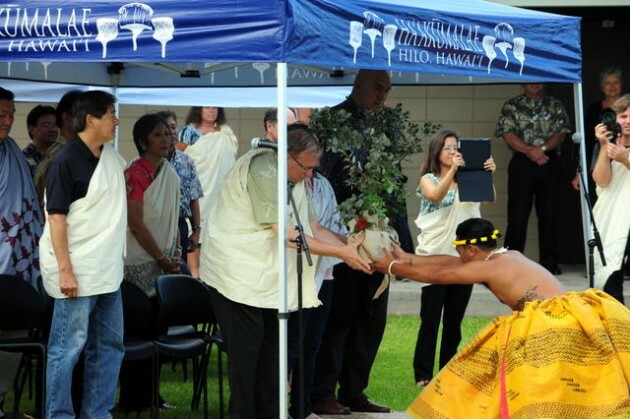 The trees were a gift from UH Hilo Chancellor Don Straney and Hawai‘i Community College Chancellor Noreen Yamane. 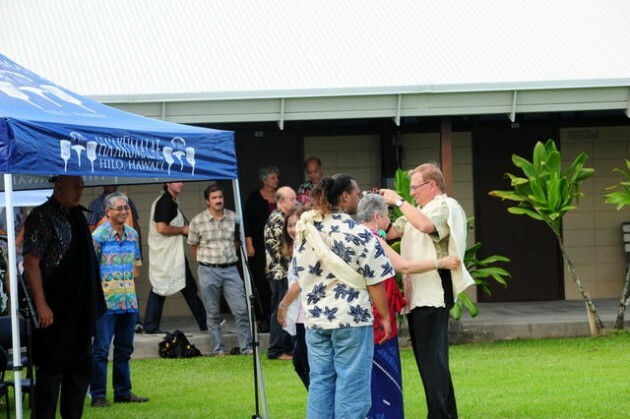 There was a small ceremony for the planting that included the two chancellors and staff from ʻImiloa. 8/30 Read more on President Greenwood’s blog. I am very pleased to announce the appointment of Mariko Miho as Executive Director of Development for the University of Hawai‘i at Hilo. Miho was born and raised in Honolulu and is the daughter of the late Katsugo and Laura Miho. 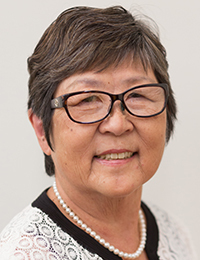 She graduated from the University of Hawai‘i at Mānoa in 1980 with a BA in psychology and has been working in leadership and development positions supporting public higher education for the past 18 years. Previous posts include director of development at UH West Oahu, community affairs and special programs coordinator at the University of Hawai‘i community colleges; vice president of donor services and marketing at the Hawai‘i Community Foundation; and associate vice president of development at the University of Hawai‘i Foundation. Earlier in her career Miho worked in diverse settings in Tokyo, Japan, Northern California and Hawai‘i, as a language trainer, business-to-business marketing communications specialist for Hewlett Packard, and nonprofit executive for performing arts and cultural organizations. 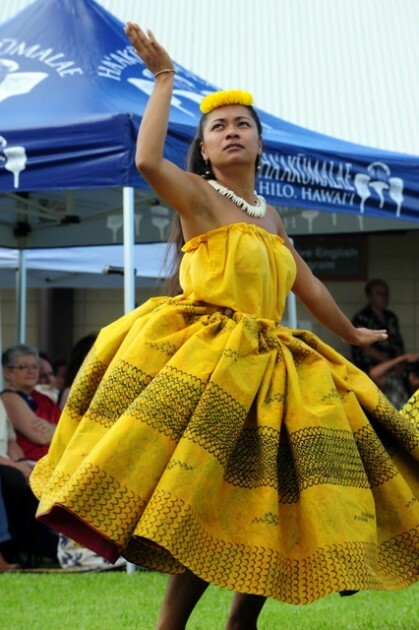 Her many interests include hula, taiko, zen meditation, Hawaiian culture and values, flower arranging, community and ethnic history, and animals, to name a few. Mariko brings a wealth of experience, skills, and enthusiasm to UH Hilo. She will be going out into our ‘ohana and the community to develop collaborative relationships for the benefit of our students and our university. Her office is located in the Kilauea Financial Plaza and you can find her contact info here. 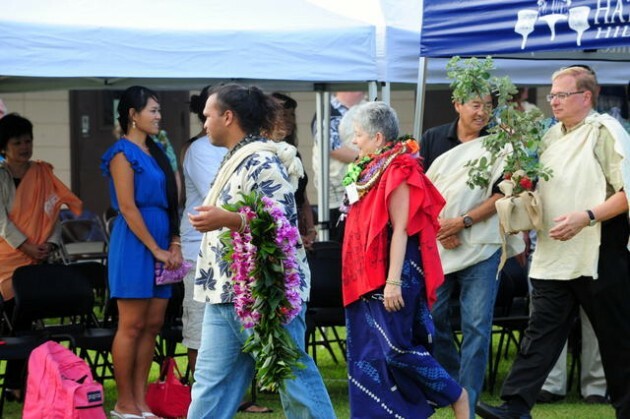 President Greenwood was honored with kīpaepae hoʻokuʻu, or “release” ceremonies, hosted by UH Hilo and Hawaiʻi Community College. UH President M.R.C. 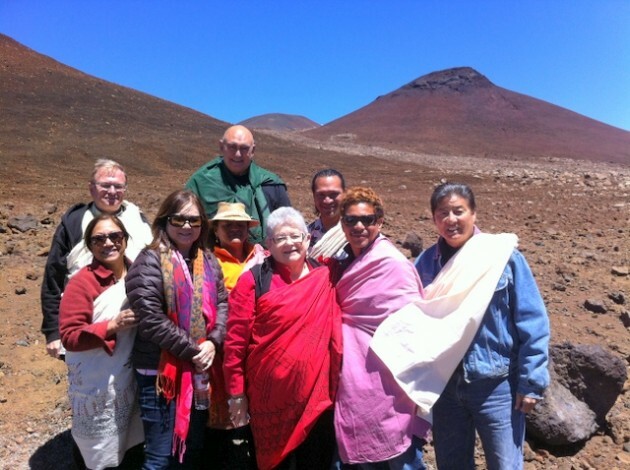 Greenwood (center front) on Mauna Kea as part of kīpaepae hoʻokuʻu, or “release” ceremonies, honoring the president before her retirement at the end of the month. Front row (L-R): Executive Assistant to UH Hilo Chancellor Gail Makuakāne-Lundin, Hawaiʻi Community College Chancellor Noreen Yamane, President Greenwood, HawCC Associate Professor Taupōuri Tangarō, UH Hilo University Relations Director Jerry Chang. Back row (L-R): UH Hilo Chancellor Don Straney, UH West Oʻahu Chancellor Rockne Freitas (at back in green), Assistant Professor Kekuhi Kealiʻikanakaʻoleohaililani (in hat), HawCC Lecturer Manaiakalani Kālua. 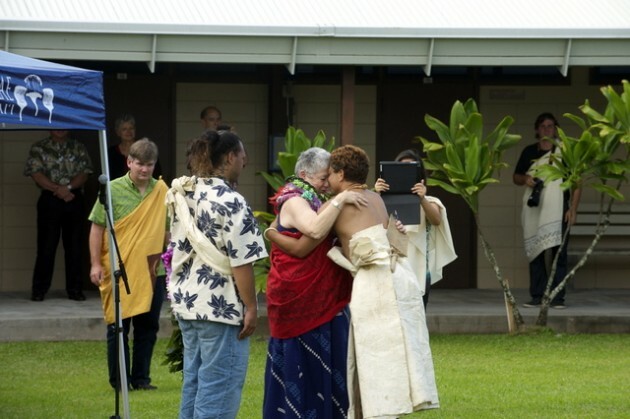 Ceremonies were also held in Hilo. University of Hawaiʻi President M.R.C. 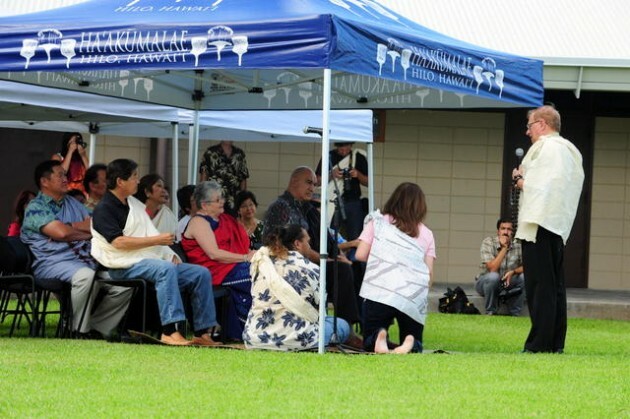 Greenwood traveled to Hilo Aug. 23 on her last trip to the Big Island as president of the UH System. President Greenwood is retiring at the end of the month. 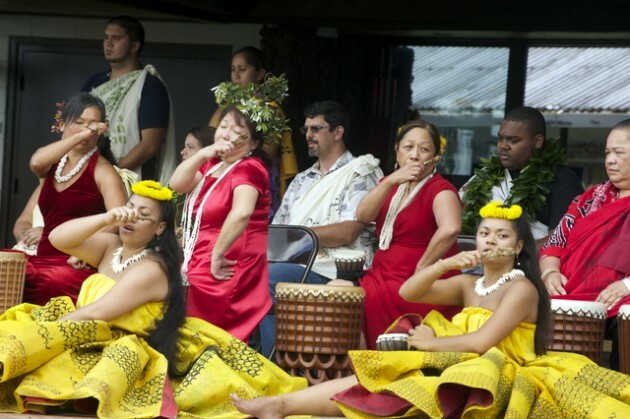 The kīpaepae hoʻokuʻu, or “release” ceremonies, included a farewell trip to Mauna Kea with a group of UH Hilo and Hawaiʻi Community College administrators, faculty, staff and students, as well as invited guests from the UH Systems and members of the Big Island community. 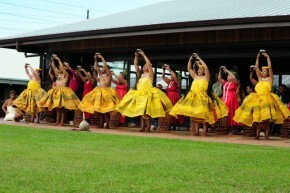 Other ceremonies were also held in Hilo, photos above right and below. See President Greenwood’s farewell letter to UH ʻohana and friends. 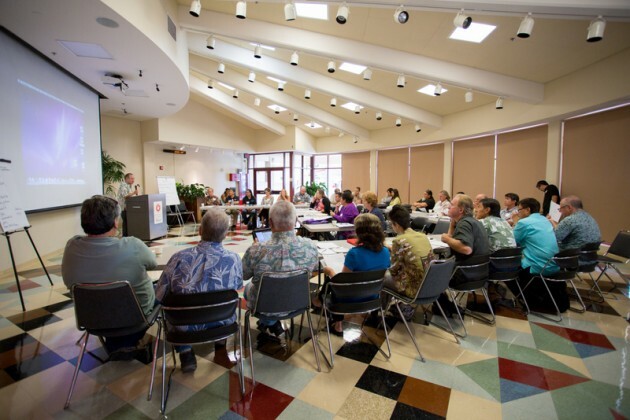 The Agricultural Summit held at UH Hilo brought together a cross section of stakeholders, including local farmers, ranchers, and food distributors, and representatives from several key county, state and federal agencies charged with providing programs in support of local food production. 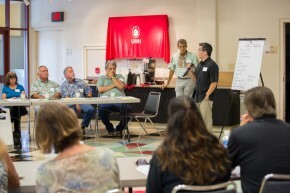 The Agricultural Summit held at UH Hilo brought together a cross section of stakeholders. Photo by Kelsey Ito. Jeff Melrose (standing at right in aloha shirt), project development specialist at the County of Hawai‘i Department of Research and Development, facilitated the meeting. Photo by Kelsey Ito. 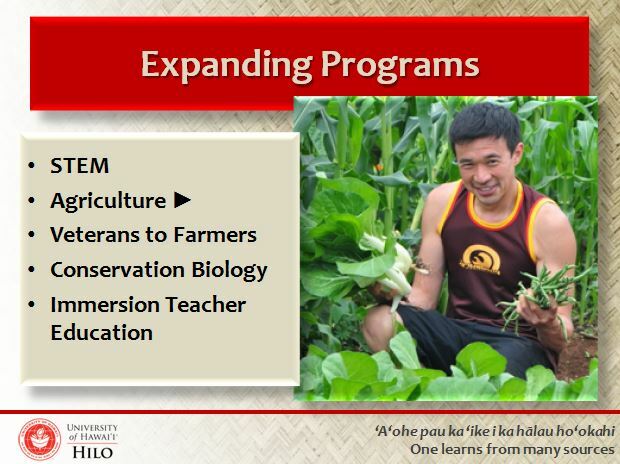 Early in August, I had the pleasure of hosting an Agricultural Summit at the University of Hawai‘i at Hilo (see Executive Summary and Action Items from summit). The summit, the first in a series of strategic discussions, evolved out of some initial discussions between myself, the dean of UH Hilo’s College of Agriculture, the County of Hawai‘i Department of Research and Development, and the deputy director of the Hawai‘i Department of Agriculture. The four of us discussed ways to focus the collective efforts of publicly-funded educational institutions and agricultural support services to enhance food self-reliance on the island of Hawai‘i. Our goal for the first summit meeting was to start a larger discussion by bringing together a cross section of stakeholders, including local farmers, ranchers, and food distributors, and representatives from several key county, state and federal agencies charged with providing programs in support of local food production. From the county, we invited R&D and workforce development. From the state university system, we invited faculty, deans and directors from Hawai‘i Community College, UH Hilo College of Agriculture, and UH Mānoa College of Tropical Agriculture and Human Resources, along with researchers, the director of CTAHR’s agribusiness incubator, and several extension agents. U.S. agencies represented included the Department of Agriculture, the Natural Resources Conservation Service, the Farm Service Agency, Rural Development, and the Pacific Basin Agricultural Research Center. Also invited was the director of the Small Business Development Center of Hawai‘i and the executive director of the Hawai‘i Island Economic Development Board. Several Hawai‘i island lawmakers attended. Representatives from private agencies with local farm interests also joined us, including a co-op specialist and farm manager from the non-profit Kohala Center, and farming/food production experts from the Ulupono Initiative, Kamehameha Schools Land Assets Division, the Hamakua Agricultural Group, the Ku I Mana New Farmer Program, and KTA Superstores. First, we heard from each of the groups and agencies, who shared information about their services along with the challenges and trends that lie ahead for their programs. This helped lay a foundation for understanding the terrain of programs, issues, and opportunities. Then, in an energetic discussion session, we heard directly from a large cross section of local farmers—Hawai‘i island food producers—who shared their thoughts on services they believe are most useful to their businesses or that they think could do the most to advance new food farming systems on our island. I, along with everyone in the room, gained much insight from the questions, answers, and ideas shared between local cattle ranchers, fruit and vegetable growers, distributors, flower producers, mac nut growers, and county, state and federal representatives. A “suggestion box” format garnished even more information about what farmers and ranchers need. 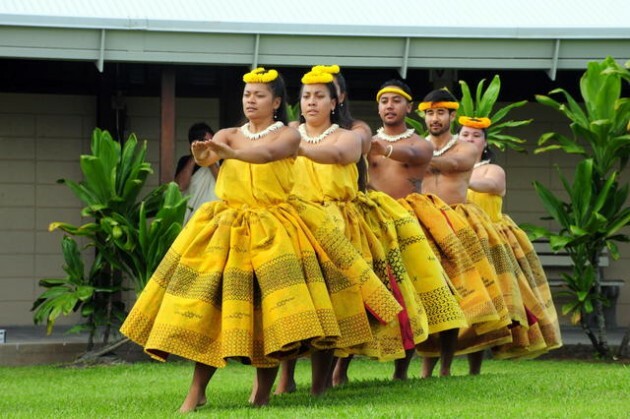 This exchange of program descriptions and farmer mana‘o provides very useful food for thought. Some topics discussed were the need for collaboration, partnerships, cooperatives, food hubs, collective purchasing, crop aggregation, farmer training programs, a vision for the future of agriculture on our island, and strategic planning. The topics of fertilizer and feed were brought up often, along with energy issues and the high cost of doing agriculture on Hawai‘i island. These topics and others discussed at this summit will be the starting point for further discussions about how the UH System and other agencies can renew our focus on strengthening local food production on the island of Hawai‘i. Stay tuned for future reports on the progress of this initiative. A slide from Chancellor Straney’s presentation. PDF of Chancellor Straney’s PowerPoint presentation. Video to follow. October 9 UPDATE: Video now posted on YouTube.